Welcome to Worthing Court, my friends! 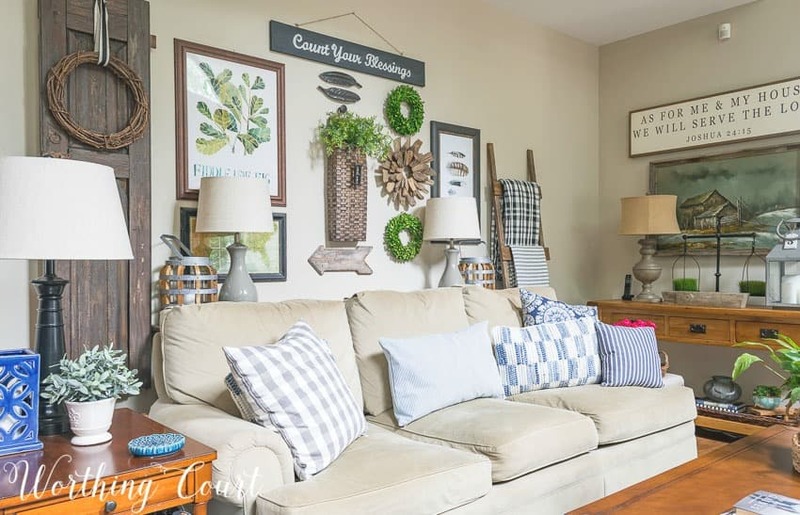 I’m so excited to have you visiting with me today as a part of Farmhouse Style Summer Home Tours hosted by Gina from The Shabby Creek Cottage! 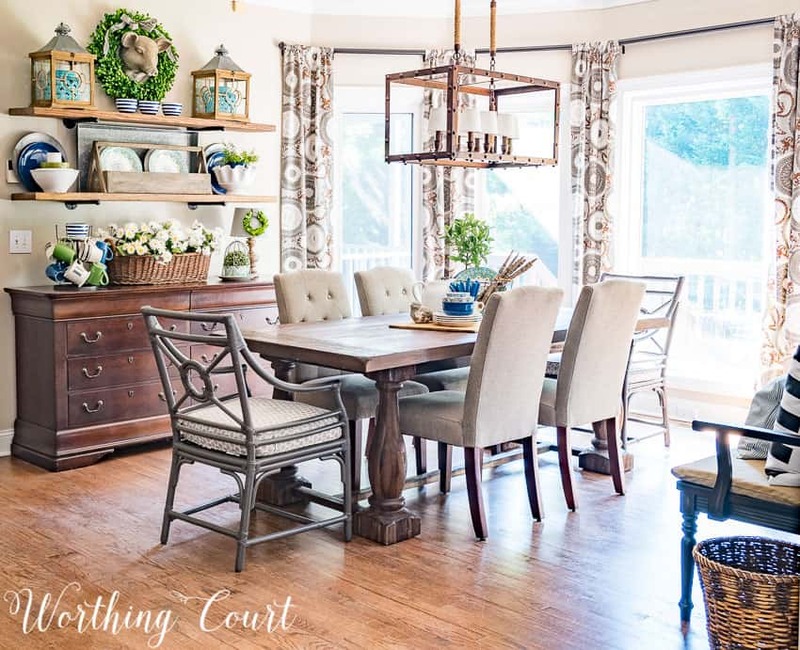 I’m honored to be joining an amazing group of bloggers who are all sharing their homes decked out in their summer finery. You’ll find links to everyone’s tour at the bottom. Just in case you’re visiting for the first time, my husband and I purchased a mid 90’s, very dark and dated, home almost three years ago, that we’ve renovated from top to bottom. There isn’t a single room in the whole house that hasn’t had some kind of updates done to it. I’m not talking about just cosmetic updates either – some of the rooms were completely gutted. Now, I’m enjoying the fun part – going back through the whole house, room by room, to put all of the finishing touches in place. You can take a look at the before and after’s of our completed rooms by clicking HERE. Come on in and let’s have some sweet tea and take a look around! 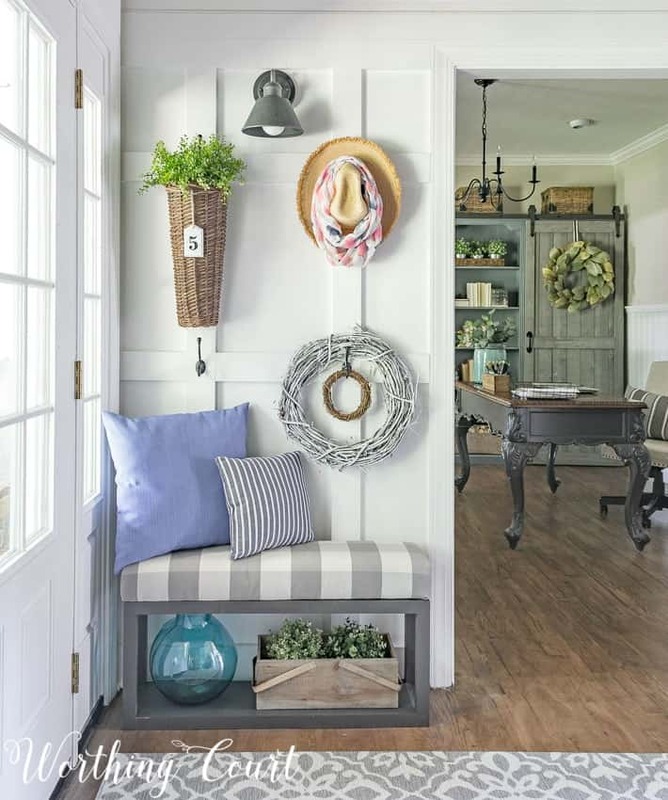 We’ll start off in the foyer, where I recently completed the addition of a board and batten wall and a pair of easy diy upholstered farmhouse benches. You can see that the opening leads into our office, which is one of the rooms that I recently completed, including the total makeover of our old cheapo cherry bookcases, diy sliding door and all. Love! All that the board and batten wall needed to be summer’fied is some greenery, texture, summery pillows a few turquoise glass pieces. From the foyer, let’s go into the family room where I kept things really simple and light on our fireplace for the summer by using natural and organic elements. Nothing too heavy or fussy for me this time of year! Would you believe me if I told you this fireplace was originally red brick surrounded by brown oak trim? Amazing what a bit of paint can do! Our sofa sits on the wall opposite from the fireplace and is filled with summer pillows! My diy blanket ladder is filled with a variety of lightweight throws for the summer and a bouquet of roses, from our yard, is a bright spot in the room. Do you have spots in your home that you struggle with? I sure do and this spot is one of mine. 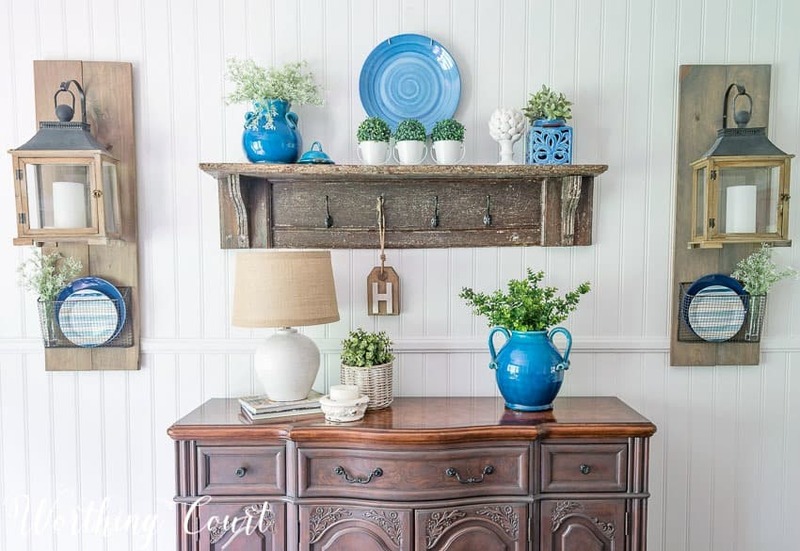 I usually have a really hard time with this console table, but for once, I really like how it looks for summer! When we remodeled our home, we enlarged the opening from the family room into the kitchen and breakfast area. It gives me a great view of our diy rustic open shelves from my spot on the sofa. 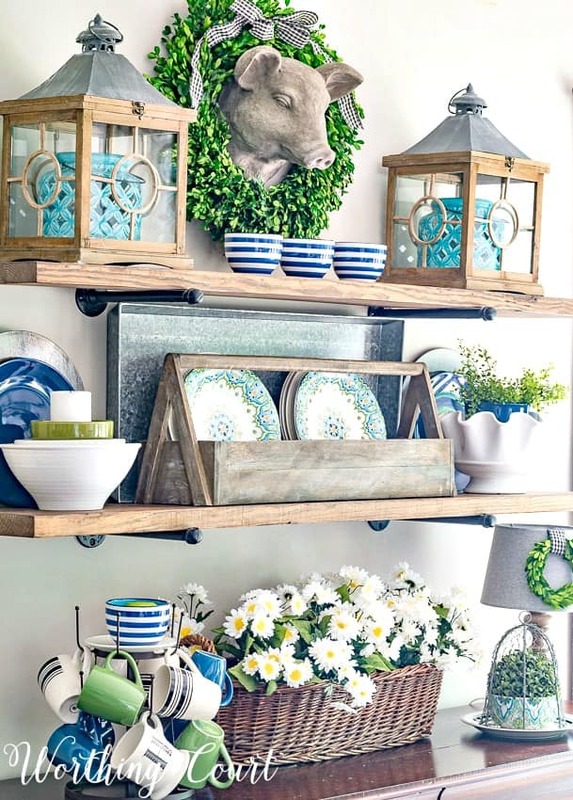 I’ve become totally enamored with blue and green for the summer and used all different shades of the two colors on the shelves. I carried those same colors over onto the centerpiece, but I kept it pretty low-key since there’s quite a bit going on over on the shelves. BTW – I know that centerpieces can be a bit intimidating, so I came up with a step-by-step photo guide for creating one for your own home. You can check it out HERE. Kudos to you if you’ve stuck with me this far! Let’s take a look at one more summer room and that’s my dining room. I’ve been keeping things on the neutral side in here for the last several months, but I’m in love with the bright and cheery pops of blue and green that I added for summer! And lastly, let’s end the tour with one of my favorite summer images – the reflection of the sideboard in my dining room mirror. I don’t know what it is about it, but I love capturing great shots of what a mirror reflects in a room! Thank you so much for coming to visit me today! And thank you, Gina, for including me in this awesome roundup of tours! 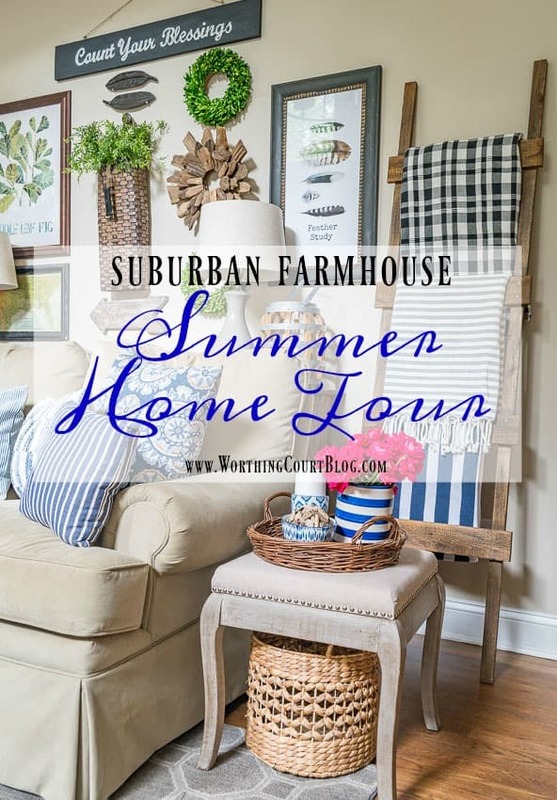 Be sure to check out the other tours for loads of summer farmhouse inspiration! 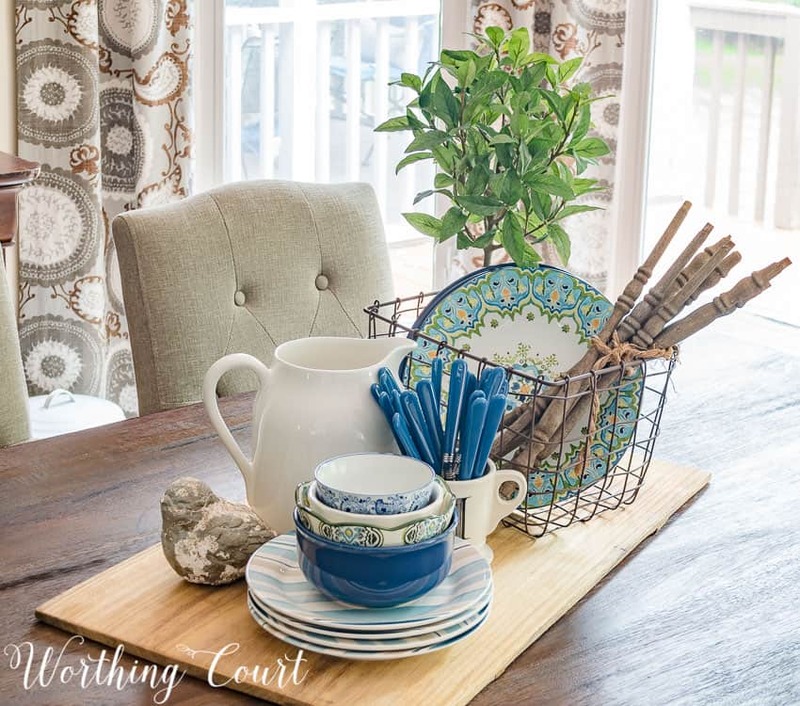 Worthing Court – That’s me! While you’re here, make sure you take a moment to leave a comment to be automatically entered into my monthly Reader Appreciation Giveaway. 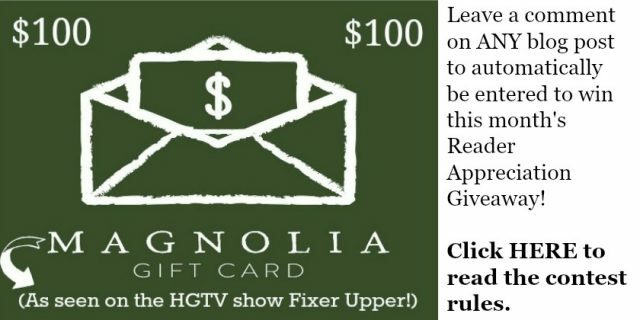 This month, I’m giving away a $100 gift card to Magnolia Market! Every comment that you leave on ANY Worthing Court blog post equals one entry, so more comments = more chances to win! You can read more about the giveaway HERE. My whole goal at Worthing Court is to inspire, encourage and help you with your own home! I’d love for you to sign up for the newsletter to follow along, never miss an update and to always find out about the latest monthly Reader Appreciation Giveaway. Blue and green is one of my favorite color combos! Your home is so inviting…every season! Beautiful home – so refreshing! Your home is beautiful! Thanks for sharing. Your home is lovely. Thanks for sharing. I see lots to incorporate into my home. Thanks for the inspiration. I just love your summer home tour. Love the combination of blue and green. You gave me some great ideas for updating my own home for summer. Thank You for the inspiration. Love your summer home. 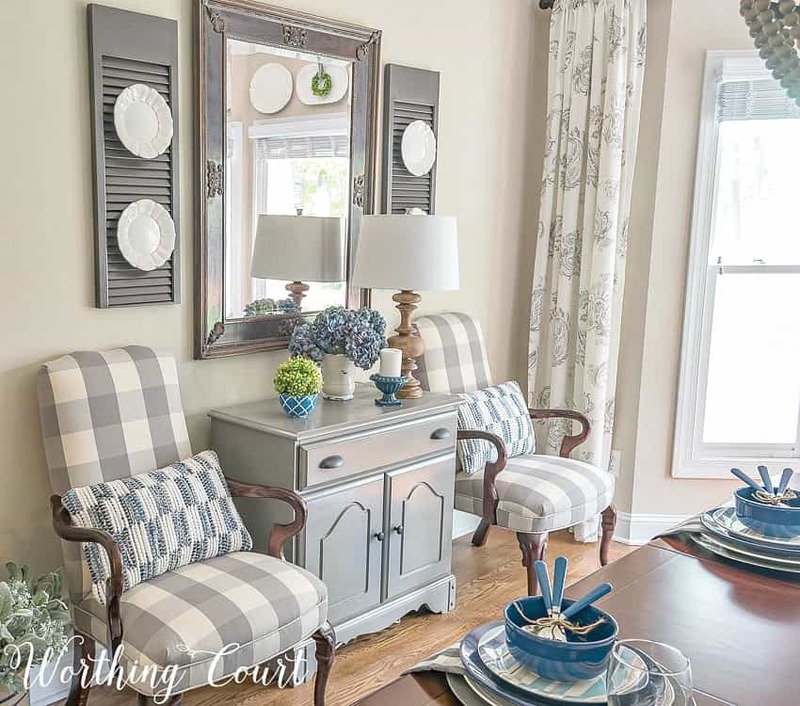 The blue and green accents combined with your neutrals are so cheerful! I love all your ideas and projects. You have inspired me to remodel my home and not be afraid to take on projects! 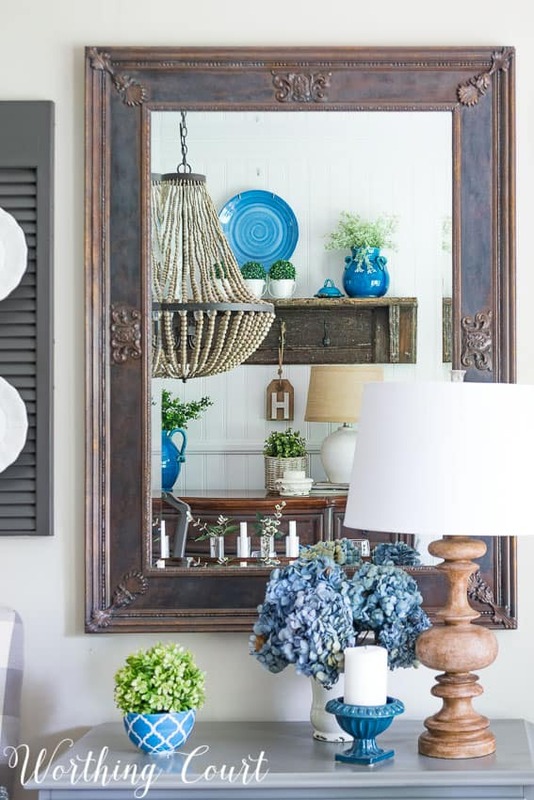 What is the source for the greenery in your large hand blown blue bottle vase on the blue dresser? Love the way you home has evolved since you first moved in. You have renovated and transformed it into the beautiful urban farmhouse that you had envisioned. Beautiful tour! Your blog is always so inspiring. The daisies are darling and look quite realistic. I better get started in my own home! I didn’t realize that you had totally redone your whole house. You’ve done a great job! Your home is beautiful! I love the plants everywhere. It’s beautiful how you incorporated them in your décor. I love your home. I utterly love your home and the sweet spirit that comes through it. Today was the first time I’ve wondered if a particular space was cluttered. My eye searched for a place to rest, although I absolutely loved every single piece you displayed (how do you do that?!) and wouldn’t have been able to part anything myself. I always struggle with when to stop decorating. When is enough enough? 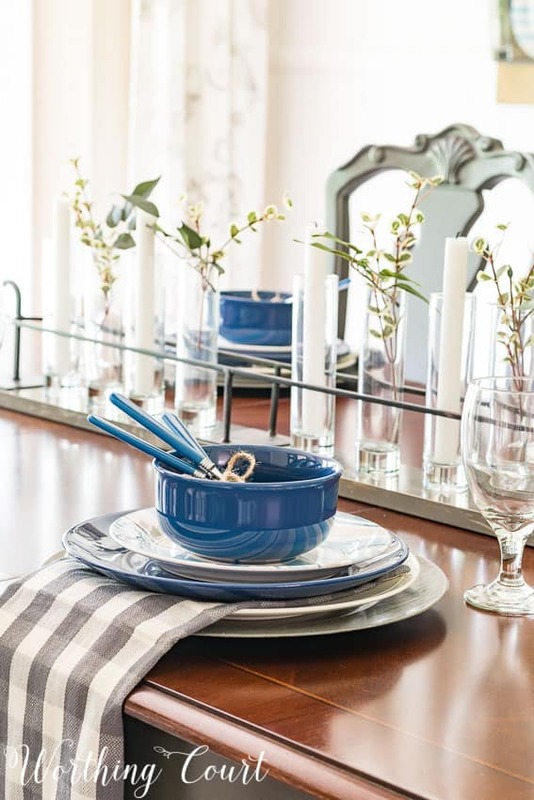 I love all the blues in your décor! Happy Monday! 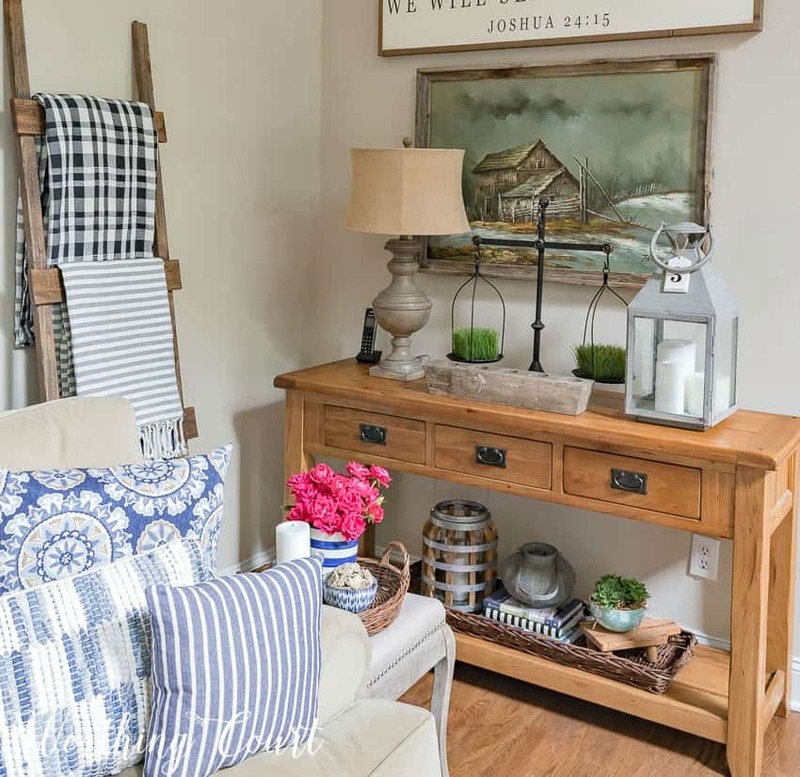 I absolutely love your farmhouse style home! It is so inviting and comfortable, especially on a warm summer’s day! SO nice, as usual!!!!!!! Thanks so much for sharing! So fun, so fresh looking, so summery, so inspiring, so when do I get to move in? Love the pops of blue and green everywhere. Beautiful job! Love all of the greenery you brought in! Your home is so pretty! So happy to be on the tour with you! Your home is beautiful!!! 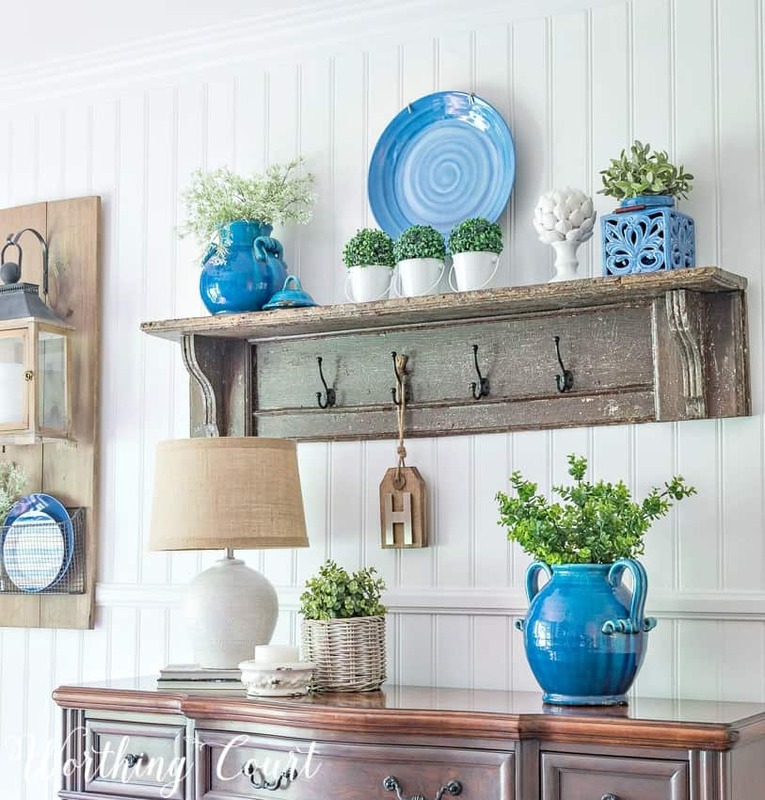 I love all the touches of blue!! 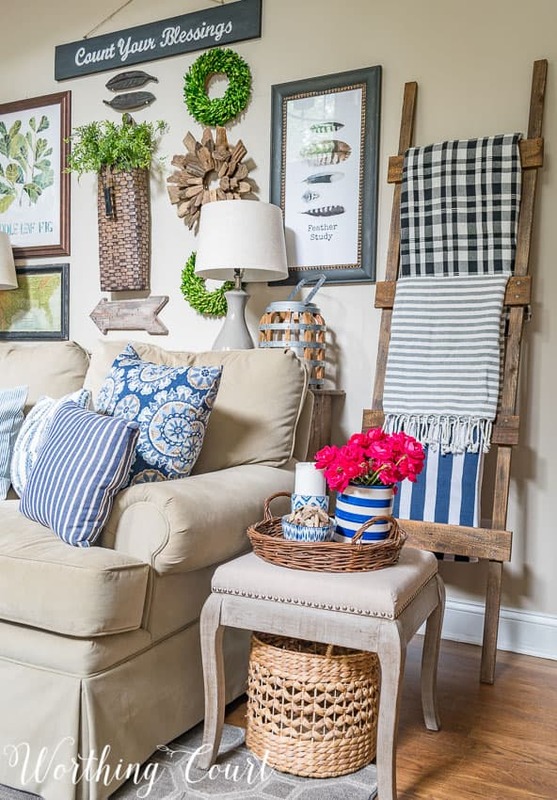 I love how fresh and summery your home looks! Absolutely lovely! Ohhhh, the turquoise glass! Wow! Beautiful inspiration as I begin to make some updates to my own home. 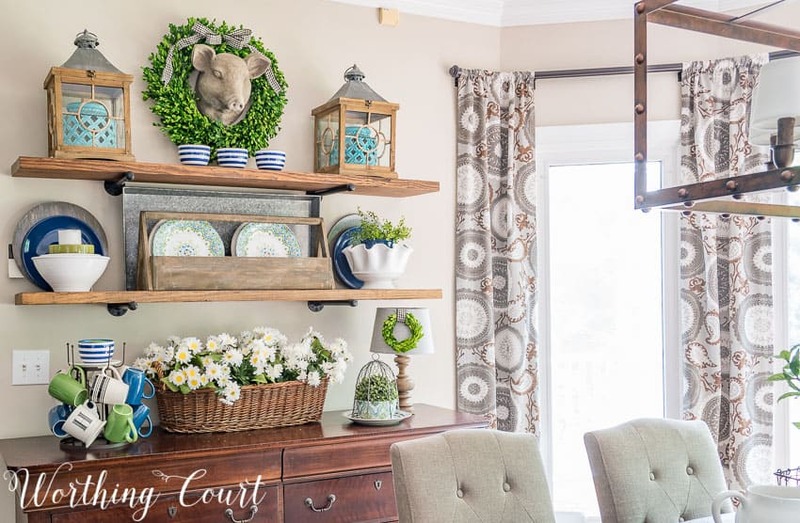 I LOVE the blue and green combo as well and your light fixture over your table is awesome! Thank you for all the wonderful ideas! Thanks for sharing beautiful home full of great decorating ideas. So fresh and summery! Suzy! You know how much I love love love your home! And every single room you have made over has the stamp of your personal style on it! And I could move right in!!!! I love how you dress a wall with the best vertical vignettes! So happy to be touring with you sweet friend! 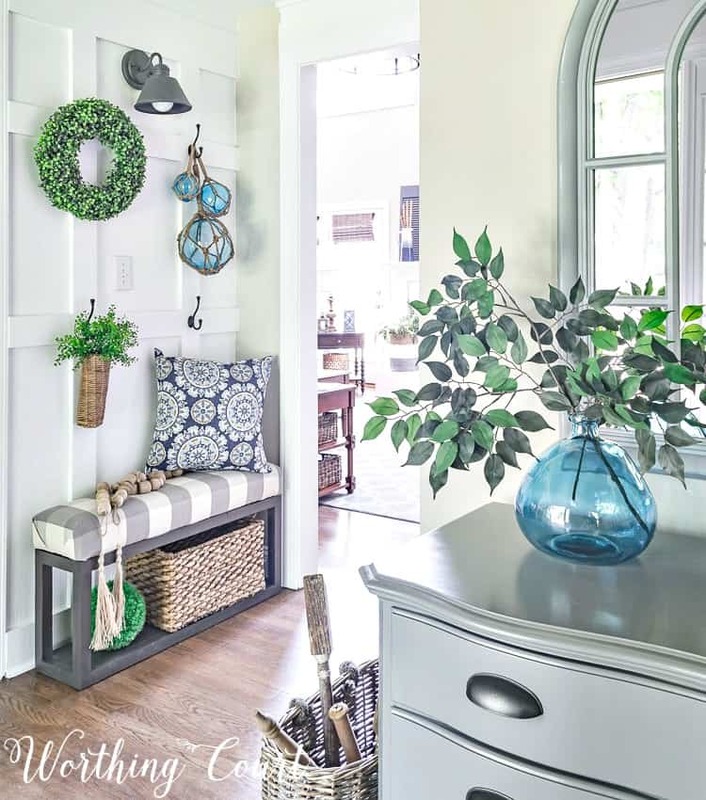 LOVE the blue/green pops that you have carried out throughout the house. 🙂 The additions/update on the decor in the foyer looks REALLY nice, too, Suzy! Thank you for sharing! Love, love, love your move towards simplicity and blue/green for summer. So pretty! 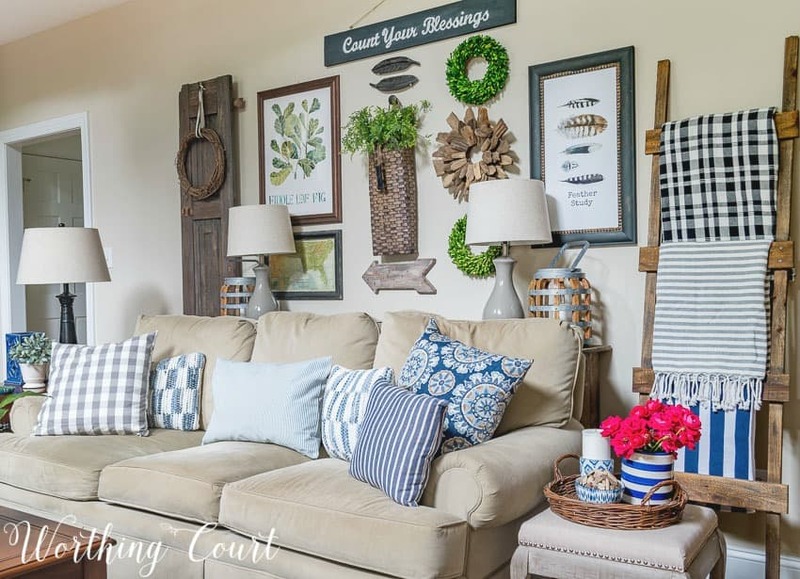 Somehow when I see your sofa wall I see one or two of the huge wooden wall signs with the beautiful sayings instead of the assortment of wall items. Perhaps I’m envisoning an extension of your simplified fireplace. 🙂 At any rate, your home is way past wonderful! Just like you I am sure. Loving all the blues and greens, Suzy! So glad to be on this tour with you! Loving the peaceful colors you’ve used … especially the blues! Your work is an inspiration! Makes me want to hunt new pillows and change my decor tomorrow! I might just do that! Looks beautiful! Love blue and green combo! Love the warm feel and pops of color everywhere. 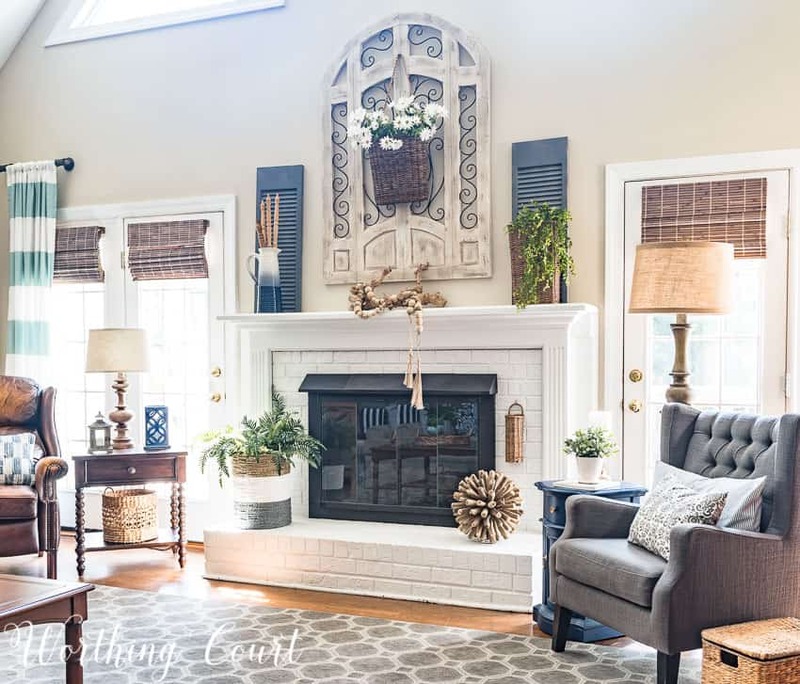 Your home is just lovely- I especially love your painted brick fireplace and the touches of green and blue throughout! Thanks for sharing. I too, love blue accents for summer! 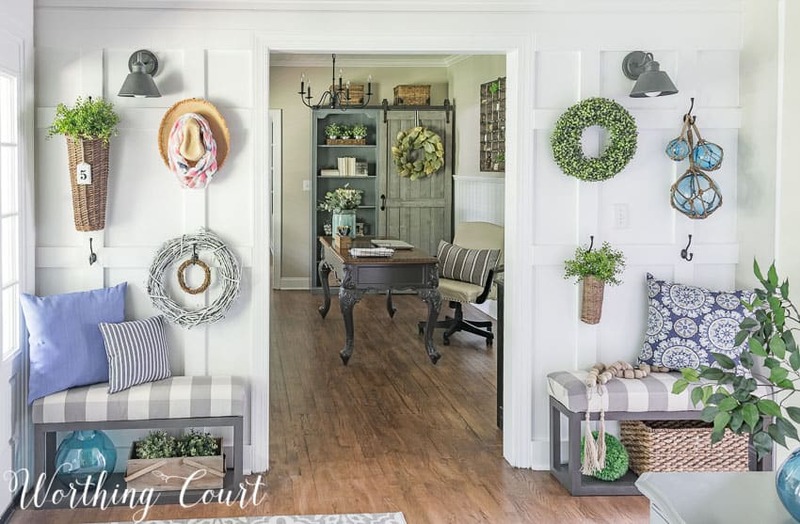 Your family room mantel decor , and your mix of natural, rustic pieces are also inspiring aspects of your home. Thanks! As always, your house is beautiful! Isn’t it amazing how a few simple changes make such a difference! You always inspire me! How did you hang the plates on the shutters? Hi Margaret. I attached a plate hanger (the kind with springs on the back that have four “hooks” that hold the plate) to each plate, then ran a piece of green floral wire from the plate hanger through a slat on the shutter. Hope this helps! Enjoy your fresh ideas for each season. Keep inspired so you can inspire us. When you first said you were painting the brick on the exterior of your house, I thought, “Oh no!” But then when I scrolled down and saw the end result, I was blown away. GORGEOUS! Love your taste and creativity. You are one of my most favorite bloggers. The blue and green is so fresh and organic. This blog post is inspiring. Now I know what I am missing in my décor. A picture is worth a 1000 words! Thanks for sharing! Beautifully curated home. Love all the summer touches. Love your summer home. The blue and white is beautiful! Love, love, love your home! And the new brick color on your exterior is outstanding – so refreshing & serene! I really like the soft grays you use to decorate with the pop of teal. What a nice change to the outside of your house. I love you ideas! I am inspired! Thank you for sharing, just beautiful! Love your home…. what paint colors did you use? So pretty! Thank you, Renee! The entire interior of our house is painted with Sherwin Williams Accessible Beige. Thank you for sharing! I absolutely love the blue and green you chose – so bright and happy!